Well, our first foray into the London market scene went pretty well I think. Early start to get to Balham in plenty of time to get set up for 9am opening and had to leave David milking the goats (what a good man he is!) but think it is hopefully going to be a worthwhile exercise. The stallholders were very welcoming and pleasant and the customers were all very enthusiastic about the goatie produce we had on offer. I believe that I am the only person doing raw goat's milk at any of the London markets and so word had already gone out via email from LFM that I would be at Balham. 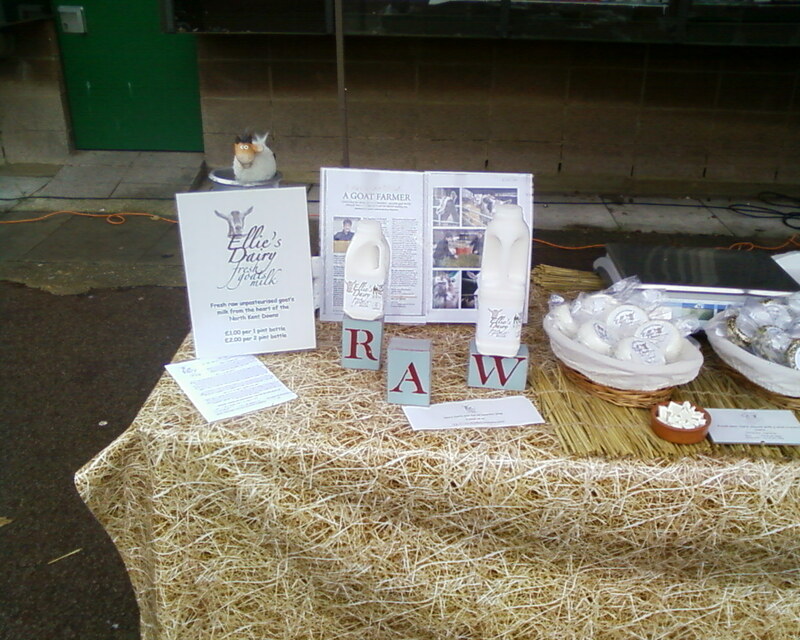 I had taken a fair amount of milk with me and had sold out well before the end of the market, which was very encouraging. Several of the customers said that they would be coming regularly to buy milk and one lady rushed over to my stall saying that they had only come to the market because they had heard I was going to be there. How popular we are!!! It was wonderful. The market manager was pleased with the stall presentation and several of the customers also remarked on how nice the display looked. This is the 'milk' end of the table .. I always try to make an effort with a stall to make it interesting - plenty of information for people to read if they want to and always samples of cheese and milk on offer for everyone who wants to taste. Very important with goat produce as many people have a pre-conceived idea that they will not like goat's cheese. My job is to convince them otherwise! Not so difficult usually when they have tasted our cheese and milk. 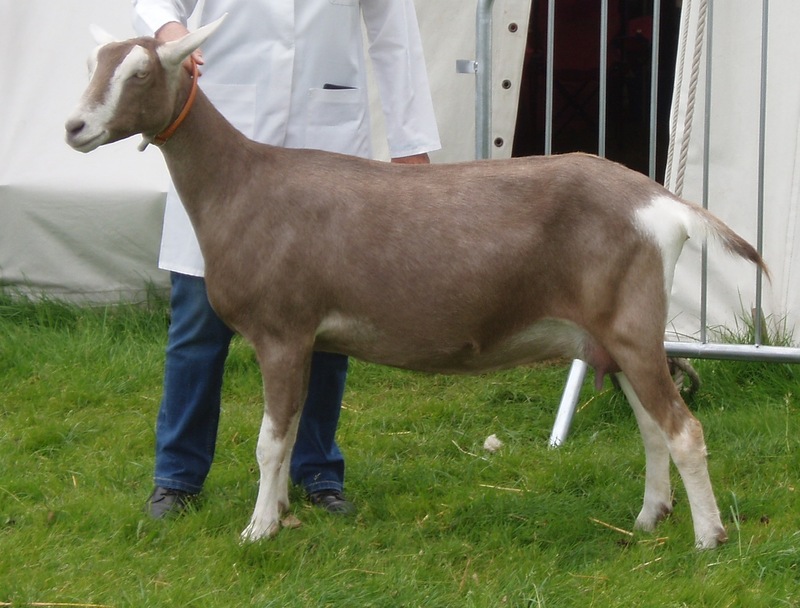 This morning I left David milking yet again as I had to drive up to Shrewley in Warwickshire for my British Toggenburg Breed Society goat meeting. It's a long drive there and back in a day but it's only once a year and it's always nice to catch up with other goatkeepers. I was delighted to meet one particular retired breeder who I haven't seen for about 5 years. Graham bred some of the earliest goats to join our herd and was thrilled to know that we still have Footsie, Flora and Foxglove. Like all the other goats we had from Graham's Mellan herd - large, stroppy and very confident! Also, very good milkers. All of his girls have given us lovely kids and although we have sadly lost Fancyfree, Fig and Firefly, we still have three of the original girls left. Cheesemaking tomorrow - probably a batch of Ellie's but maybe Shaggy's camembert to get the stocks up. Will make my mind up on the way to the cheese plant in the morning!